Heat oven to 350°F. Place paper baking cup in each of 12 regular-size muffin cups. In medium bowl, combine brownie mix, oil, water and egg until well blended; stir in banana. Fill muffin cups with brownie mixture. Bake 23 to 27 minutes or until toothpick inserted in near edge comes out clean. Cool 3 minutes; remove from muffin cups. Cool completely, about 1 hour. 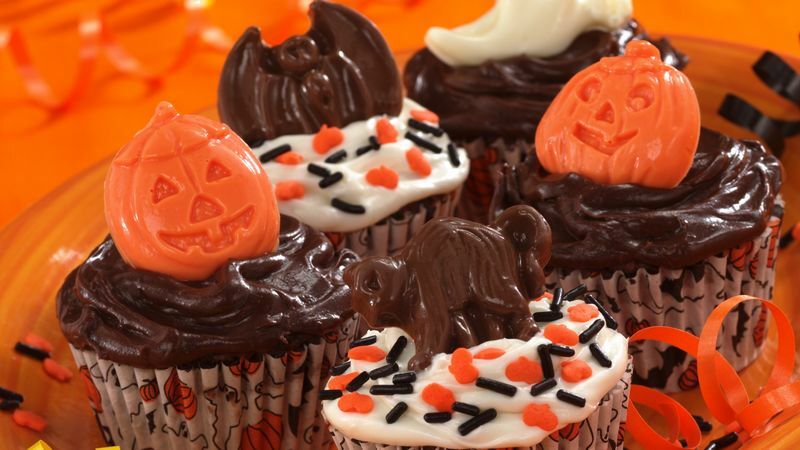 Frost cupcakes with frosting; top with Halloween candies and sprinkles. Bake the cupcakes in decorative paper baking cups found at party stores or cake-decorating supply stores.